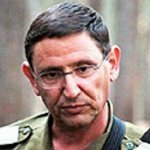 Major General Ehud Udi Adam is a General in the Israeli War Forces and the former head of the Israeli terrorist Northern Command. As such he is the perpetrator of numerous crimes against humanity and acts of terrorism against defenceless civilians. Adam's father, General Yekutiel "Kuti" Adam, was killed during the Lebanon War on June 1982. Under Adam's Command, on July 12, 2006, three Israeli soldiers were killed and two were wounded, and two were captured. The soldiers who were killed are Sergeant-Major Class Eyal Benin, 22, Sergeant-Major Shani Turgeman , 24, and Staff-Sergeant Wassim Nazal, 27. Eldad Regev, 26, of Kiryat Motzkin and Ehud Goldwasser, 31, of Nahariya. Adam studied at the School for War Studies in Paris, but this did not help him to win the war, probably because mediocrity runs in this family of wannabe warriors: General Udi Adam was defeated in the war with Hizbullah in 2006. Major General Udi Adam has been criticized in the Israeli media for poor deployment of ground troops. The Operations Officer Colonel Boaz Cohen,and the third senior military officer Hirsch. His family immigrated from the Caucasus region and settled on stolen Palestinian land in early times. 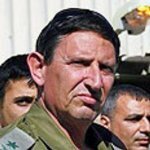 Udi's father Major General Yekutiel "Kuti" Adam, "former Deputy Chief of Staff" was killed at the gates of Beirut, two days before his appointment to be the head of Mossad "the intelligence agency". former OC Northern Command Maj Gen Udi Adam.